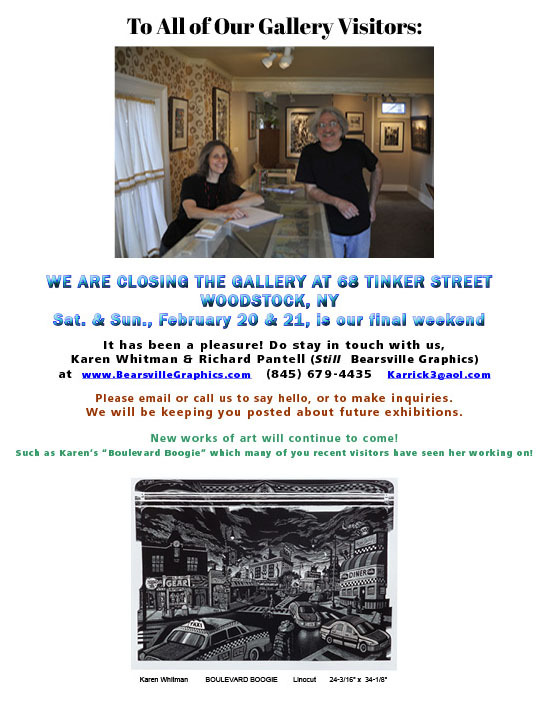 We, Karen Whitman and Richard Pantell (of Bearsville Graphics), are closing our gallery at 68 Tinker Street in Woodstock, New York. Come on over during our final weekend, Saturday, February 20th and Sunday, February 21st, to say hello, say goodbye, and see what we have been working on (like Karen’s “Boulevard Boogie”). Please email or call us to say hello, or to make inquiries. We will keep you posted about future exhibits. There are still new works to come!